Forward "Pittsburgh Penguins" Evgeni Malkin was removed before the end of the match of the NHL regular season with the Philadelphia Flyers. At the end of the third period, the Russian dismissed the stick from Michael Ruffle, trying to “drive off” the opponent, hitting him in the head. For this, he received a five minute penalty, although he did not hurt his opponent. Hockey player said that in his actions there was no malicious intent, however, the incident became interested in the disciplinary committee of the league. 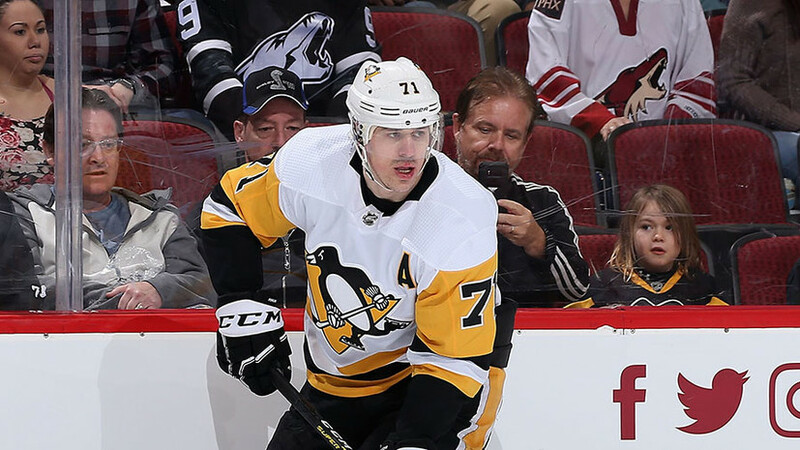 Malkin faces a fine or suspension for one game. While the forwards of “Washington” Yevgeny Kuznetsov and Alexander Ovechkin demonstrated performance miracles, their compatriot Yevgeny Malkin was not doing well. In the away game with “Philadelphia,” the Russian striker did not cope with the emotions and was removed from the ice in the end of the third period. Fortunately for his partners, this did not prevent Pittsburgh from achieving a crucial victory and interrupting a protracted series of four defeats in a row. It is noteworthy that the unsuccessful series of "Penguins" coincided with the injury of Malkin. On January 31, in a game with Tampa Bay Lightning, Eugene fought with rival captain Steven Stemkos. As a result of the brawl, he suffered a hand injury and was forced to miss five meetings. Only a day before the match with "Philadelphia" he was able to return to full training. Previously, he was forced to engage in contactless jersey. At first, the meeting evolved for Malkin quite successfully. In the middle of the second period, the Russian forward extended his effective series to six matches, playing the role of assistant in the episode with the goal of Nick Bugstad. By the way, Eugene recorded at his own expense the sixth assists in the last five games, which is a good indicator. True, he still has serious problems with abandoned washers. This season, he only struck the gates of his rivals 14 times and cannot distinguish himself in exactly one month. His last goal dates back to January 12, when the Anaheim Dax confronted the Pennsylvania team. However, all the successes of the Russians were crossed out in the final segment of the third period. By this time, the outcome of the meeting was almost predetermined. Pittsburgh led 3-0, and the final siren was about five minutes, when Malkin and Michael Ruffle clashed in the center of the square. In an attempt to take the puck away from the Russian, the Philadelphia striker acted quite persistently, and having lost his chance to take possession of it, he began to behave very dirty at all. So, first an Austrian hit his counterpart with his fist in the left side, and after - in the back of the head. This finally brought Eugene out of himself: turning around, he waved his stick, but did not touch the provocateur. Raffle hurried to show the referee and the audience how much he got, and fell on the ice. Although on slow replays it is noticeable that the contact of the helmet with the club was avoided, and if it was, it was tangential. Michael, however, pretended that the damage was still caused. However, this behavior Malkin could not go unpunished in any case. After deliberating, the referees Eric Furlatt and Kyle Reman discharged the Russian penalty match to the Russian and sent him to watch the rest of the meeting on TV. Upon its completion, it became known that an incident involving Malkin could have a development. As reported in the press service of the NHL, the behavior of the Russian forward "Penguins" will consider the disciplinary committee of the league. He will have to determine the nature of the violation and possible sanctions against the player. It is noted that he faces a fine or discharge for one game, while the opponent's provocation was ignored. After the final siren the episode with the participation of the Russians discussed more of the result of the meeting itself. So, Malkin himself spoke to journalists. He admitted that he had behaved incorrectly, dismissing Raffle. “I know that I played stupid, because there were only five minutes left before the end of the match. It was dirty, but I didn’t get my stick in his head. Everyone wanted to give me a five minute penalty. It was not dangerous for the opponent, there was no blood. I know that my act allowed Philadelphia to spend the rest of the time in a numerical majority. Well, next time I will be smarter, "quotes Malkin USA Today. Pittsburgh head coach Mike Sullivan also defended his ward. According to him, such a violation does not deserve further proceedings by the NHL. “I think Malkin simply reacted, he was beaten on the back of the head. It was a two-player fight, and he responded. I was surprised that he was discharged the match-penalty, because the player was not injured, there was no serious contact, but the judges thought otherwise, ”said Sullivan to the Pittsburgh Tribune Live. The current season at Malkin turns out extremely ambiguous. Despite all the difficulties, he shows good performance, having 56 (14 + 42) points after 51 matches. In this case, when the Russian team misses a lot. This is evidenced by his utility ratio ("-17"), with which Eugene is among the 15 worst league players. And this is taking into account the fact that recently the situation has begun to straighten a little. Most recently, he was one of the top three hockey players with the lowest plus / minus in the NHL. In addition, the earlier behavior of the attacker "Pittsburgh" has already become the object of litigation by the disciplinary committee of the NHL. In November, a Russian was accused of harshly meeting TJ Oshi, the Washington Capitals forward. Although the player of the “capital” himself rushed headlong at Eugene and eventually hit his head on his forearm, after which he collapsed on the ice. Malkin received a match-penalty and left the court ahead of schedule. Many experts saw the evil intent in Eugene’s actions and called for disqualification for 10 matches, but the disciplinary committee did not agree with them. He recognized the episode game and did not penalize Malkin. Subsequently, the Russian himself explained his behavior and wished him health. “First of all, I am glad that TJ returned to the game and did not get a serious injury. Hockey has become very fast. I got the puck and made the transfer to Crosby. Oshi was approaching me, but my act cannot be called dirty. The elbow was not high, I did not seek to get into his head. You can say that I was not lucky. Of course, one can understand the dissatisfaction of “Washington,” the Pittsburgh press service quotes Malkin.